Today is the second Friday the 13th in two months and next Friday there is a solar eclipse. How many more days of ill omen do you need so close together before you start thinking there might be trouble ahead? Personally, I have had a series of unlucky Friday 13ths, but I know statistically people are no more likely to have bad things happen on a Friday 13 than on any other day. Likewise, solar eclipses are not necessarily bad news.I am often more concerned if I repeatedly draw tarot cards that traditionally mean misfortune. About this time last year I drew the spread you can see above - Death, The Tower and the Ten of Swords. They are among the scariest cards in the set. The deck I drew them from - The Victorian Steampunk Tarot - has some particularly dark images too. It was at a time when things were not running smoothly in my life. Among various problems, my husband had lost his job in a particularly unpleasant way, my freelance work was going through a lull and we were struggling to find enough money to live on. When I drew the cards above one morning, I was worried about what might be coming next. I photographed the cards and waited. Whatever happened would be a learning experience - and perhaps something to blog about in the future. This Friday 13 seems the right time. First, a look at what the cards mean. Death: As I said on my blog last October: "Death comes to us all and all that lives must die. Of course, drawing the Death card, number 13 in Tarot's Major Arcana, doesn’t usually mean we are about to meet an untimely demise. It does, however, remind us that death is always all around us as an essential part of the cycle of life." The Tower: This is a card about sudden loss or destruction. It is a card I kept drawing in the weeks leading up to the unexpected ending of a long-term relationship many years ago. Like Death, it is a card of transformation, only less gentle and natural. Nevertheless, the change it brings can eventually turn out to be for the best even if it doesn't seem like that initially. Ten of Swords: This is another card about things coming to an unpleasant end. The Victorian Steampunk Tarot (in which the suit is represented by bees) says: "The Ten...shows dramatic endings; it is a common card for betrayal, redundancy, or the end of a relationship or friendship." You can understand I was at least a little concerned for the future. But what happened? The next day a stray cat I had been feeding in my garden (the grey tabby in this photo) had a bad accident. I heard him meowing at my door, which he usually did when he wanted food. When I opened the door, I saw the poor moggy's tail was almost severed. It was badly broken and dripping blood. He was obviously in great pain and distress. I popped him in a pet carrier and took him to Cats Protection. The vet at the animal charity kept him in to run tests on his general health before deciding what to do. I was by now certain that once the cat had been treated, I would give him a home. The next day, I had a phone call from Cats Protection with even more bad news. The poor cat had tested positive for FIV - feline Aids. I would not be able to keep him because of the risk of infection to my other cats. It was touch and go whether the beautiful, friendly creature would have to be put down. I was heartbroken. Thankfully, Cats Protection does everything it can to save cats. It managed to find the stray (minus its tail) a home willing to take in an FIV-positive moggy. Was that what my cards had been about? I don't know for sure, but it seems possible. In any event, the ending was better than it could have been and I trust that the cat is still alive and happy and having the best care possible. 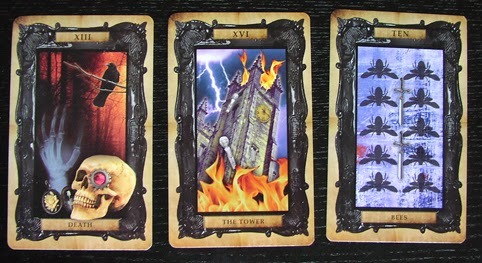 Why I am blogging about this now, is that I think it shows however bad omens might be - from Friday 13ths and eclipses to scary tarot cards - the outcome isn't necessarily a complete tragedy. I hope you have a day in which only good things happen.